There is no denying that our feet are often not as appreciated as they should be. When compared to the attention we give to most other parts of our body, our feet have it pretty bad. They carry the full weight of our bodies, get callused and achy, and most times, there is no actual care directed. Whether your daily activities involve you making ample use of your feet or not, they deserve some care and pampering once in a while. A viable way to make this happen is to employ the use of a foot massager and not just any piece of equipment, opt for one of the best foot massagers on the market. There are a lot of benefits that come with indulging in a pleasurable foot massage every now and then; not only will your feet feel great, but your whole body will also be revitalised. The good news is that you do not have to leave the comfort of your home to get a stellar massage. Nevertheless, you will need the right equipment for the job and the Miko Shiatsu Foot Massager is more than able to offer the full spa treatment that will change your life for the better, in just a couple of minutes. The best part is that it is way more pocket-friendly to get one of these than to frequent the spa. With the simple click of a button, your feet will get the pampering they deserve and it’s on your own terms too! The overall design of this product features two independent foot chambers which simultaneously work on the bottom sides of the feet. The air pressure released touches every inch of the foot and applies an adequate force that helps to relieve all sorts of pain, ranging from muscle tension all the way to plantar fasciitis. In order to make the process even easier, there are two wireless remote controls included. This device is sure to relieve your achy feet and improve the overall blood flow with its 5 different pressure settings which are meant to target specific pressure points. This foot massage machine can also perform actions such as deep kneading, subtle vibrating, rolling as well as heat functions. All you have to do is pick a mode then sit back and relax. Make sure you also check our guide to the best foot spas. Although there is nothing that can compare to a good old foot massage given to you by a pair of experienced hands, what are the chances that those hands will be available every time you need them? Eliminate that uncertainty with the help of a mechanical companion that can massage your feet at your beck and call. Not just any old massage machine, but one like the Nekteck Foot Massager with Heat. This device features a very versatile design; it is fitted with 18 massage heads that come with 18 rotating massager nodes. Once fitted in, relax and enjoy as all the tension melts away not just your feet but on the entire body. The legendary heating function of this machine sets it apart from the rest. It is put in place not only for your pleasure but to also help relieve muscle pain. As this heating function is an additional feature, it is not compulsory to use it and can manually be turned on and off if not needed. Another user-friendly function of this machine is its adjustable height. For the comfort of users, it can be adjusted for up to 3 different levels which are wholly dependent on your preference and convenience. Additionally, this foot massage machine is as easy to operate as they come, after a long day on your feet, the last thing you want to do is bend down to turn on this device. As such, there is a handy button that can be accessed with your toe and you are good to go. To crown it all up, you can carry this device from place to place quite easily thanks to its built-in on-board cord storage and carry handle. Taking care of your feet does not just relieve physical issues, but your mental health can also benefit largely from the simple act of having a foot massage once in a while. There are certain points on your feet that can help reduce the symptoms of depression and other mental stress. So, why not make an investment towards your mental health by purchasing the Human Touch Reflex-4″ Foot & Calf Shiatsu Massager? As aforementioned, this foot massage machine makes use of patented figure-8 technology and with this, it completely surrounds the feet all the way to the calves. The fluid offers up a massage that mimics the techniques that most professional physical therapists use, as such, you can be sure that you are not missing out by opting for a home spa. The overall design of this foot massager is quite ergonomic with its enhanced tilt angle that flawlessly matches the body’s functions. This is sure to keep you comfortable throughout the whole process. This device also works by using stimulation under-foot reflexology rollers that provide a much-needed massage to the soles and heels. Seeing as they do a lion’s share of the work allocated to the feet, this feature is sure to provide a whole lot of relief. To increase its user-friendliness, it is fitted with non-skid floor protectors that are sure to keep the device in place while in use. And for easy portability, it also comes fitted with an easy carry handle. All in all, the reflexology massage provided by this foot massage machine goes a long way to bring the body back into its natural equilibrium. This, in turn, promotes the body’s natural healing power; be it for physical or mental pain. 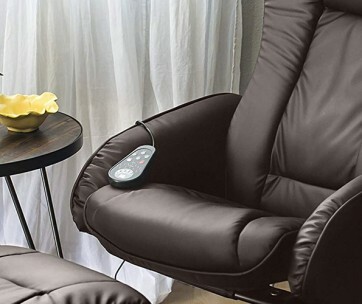 Our handy guide to the best massage chairs features more great products like this. Shiatsu as a technique dates back to ancient Japan, yet its benefits are still being reaped in our contemporary society. Though it translates to ‘finger pressure’ in Japanese, that has not stopped some special machines from employing this technique to relieve pain as a whole. The Shiatsu Foot Massager Machine is one of such devices that can solve both physical and mental ailments and in the case that you have never heard about it, here is all you need to know. The overall design of this device features 2 independent foot chambers which are there to give you the much-needed combination of shiatsu rolling massage therapy. All this is taking place while air pressure is applied to all parts of the foot. Hearing the words ‘air pressure’ can make it sound all too intense, but that is not an issue as this feet massage machine offers the option of adjustable intensity. In the case that you are in the mood for anything ranging from a mild relaxing massage to deep tissue shiatsu kneading massage, all you have to do is adjust the intensity by simply choosing between 3 different levels of pressure. Generally speaking, the aim of the Shiatsu massage is to strengthen the immune system and activate the life force. Especially in relaxation, our natural self-healing and regulatory powers are stimulated hence why this device has been deliberately designed to mimic real-life Shiatsu movements by operating on a bidirectional massage mode for a more pleasurable experience. What’s more, you change even the kneading direction with just the push of a button. Also incorporated in this electric foot massager is a heat function that can altogether improve blood circulation, relieve muscle tension and chronic nerve pain among other things. This function equally makes it the best foot massager for plantar fasciitis, you can be sure that it will combat this condition with all it has got. To crown it all, though this may seem like a background advantage, it is just as important as the rest. This foot massage machine is efficient and particularly easy to clean with its washable feet pockets. Simply detach them by zipper and voila. Our feet are so much more important than we could ever imagine, they do not just carry us from place to place but also function as a portal to the entire nervous system. The great work that our feet do on a daily basis without getting much credit is highly underrated. It is a proven fact that over the course of a day, feet take a cumulative force of a couple of hundred tons. This sounds like a feat that makes them deserving of some pampering now and then. If you are in the market for such an experience, then a dependable device would be the Giantex Shiatsu Kneading Rolling Vibration Heating Foot Calf Leg Massager. Have you ever heard that all good things come in threes? Well, the producers of this massage machine sure do think so as they have incorporated 3 custom modes of foot massage, 3 intensities of calf massage as well as 3 levels of heating. As a result, you can personalize the service you get from this device to suit your needs and comfort level. 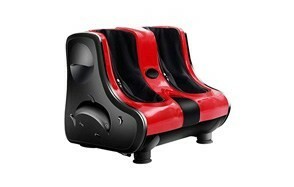 It also delivers a 360-degree massage using 8 massage discs for the feet and 4 discs for the calves. In terms of functionality, this device is as multifunctional as you can get; so, whether you are in the mood for some Shiatsu, kneading, vibration, rolling or heating, there is no doubt that you are covered. 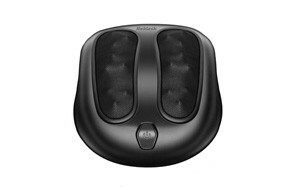 Overall, it comes in an ergonomic design which is put in place to replicate the ancient massage technique of Shiatsu which typically targets sensitive areas on the calves and the soles of the feet. The machine works by separately or simultaneously delivering high-quality movements to the feet and calves. As for usability, this massage machine is pretty straightforward. It offers a handy touch panel which can be used to control the entire device along with the fact that it automatically shuts off after 15 minutes of use. Just sit back and enjoy the ease and peace of mind that this product offers. 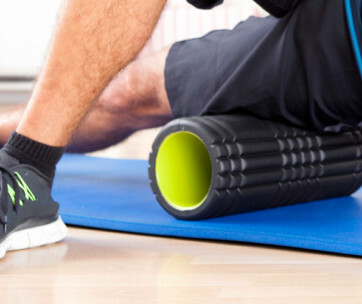 Find more great products like this by checking out our guide to the best foam rollers. The effective therapeutic technique of Shiatsu is mainly used for physical exertion, improvement of posture and deep relaxation of the body. Most problems that ail us can easily be solved with a simple shiatsu massage on the feet and as such, we really need to step it up and invest in a high-quality feet massager. Thank heavens devices such as the TRIDUCNA Shiatsu Foot Massager Machine with Heat have brought the Shiatsu technique right into our homes. This massage machine is just as good as any massage professional but without the price tag and is designed to soothe and heal pain. It works with a number of mini ergonomics massage nodes that work hand in hand to relax your feet after all the stress the day has thrown. However, Shiatsu is not the only technique that this device uses to alleviate pain; it also works by kneading, rolling and making use of air pressure. This is user-friendly for your everyday foot massage, you can control all the functions by simply touching the sensitive panel located on the unit. All the operations can either be used separately or simultaneously on 3 different levels of intensity. With just the push of a button, you can adjust the intensity for the desired pressure and turn off any functions not needed. Nevertheless, it is quite beneficial as it helps to improve blood circulation, relieve pain and also reduce the intensity of the pain altogether. Who knew that getting a massage could be so easy and accessible? If you want to ease pain and tension on your feet, do not just settle for a couple of squeezes and rubs every now and then, make it a routine to get an intense foot massage. Thankfully, you no longer have to set appointments or venture out far to get this done – just sit back in the comfort of your living or bedroom and use a top-notch device like the Weffort Shiatsu Kneading Foot Massager. This is as realistic as it gets, seeing as this stellar device goes out of its way to mimic a real-life massage. After a couple of minutes using this massage machine, the relaxing feeling you have all-around will be enough motivation to get you on the foot care bandwagon. This particular device has 3 adjustable options for massage strength and is also fitted with a timer that runs from, 5 to 15 and all the way up to 30 minutes. This all makes the experience more tailored to your needs and for your overall pleasure, this massage machine has deep kneading shiatsu nodes that really get in there and work on your feet in order to relieve all sorts of pain ranging from muscle tension to plantar fasciitis. Without the heat function, this definitely would not have been a well-rounded foot massage as it is also put in place to help with pain relief. To crown it all up, this device is easy to use and take care of; when washing, simply take off the foot sleeves and attach them right back after cleaning. There are a number of foot massagers out there, some are great while the others are on the opposite side of the spectrum. So, how does one go about acquiring a massage machine that will be worthwhile? This guide will help point you in the right direction so that you can make the right choice. Reviews - The importance of reviews in the lives all consumers cannot be hammered on enough; this is the one way that the contemporary shopper can get the lowdown on any given product they desire to buy. In this case, the producers of foot massagers are most likely to put out all the great information about their product because the slightest smell of weakness will drive down their sales. On the other hand, reviews offer fresh insight from real people who have had the chance to use these devices and as such, you should take into consideration all the information you can glean from them. Price - In most cases when it comes to the price of products, what you pay for is eat you get. Using this logic, it would be most beneficial to anyone on the lookout for the best foot massagers. Although not all time, it is very likely that the price most likely equates to the level of quality that can be expected. This is by no means the case 100% of the time, in a few instances, you really do not have to break the bank in order to get a great product. Be sure to read up, ask questions and do your research so that you get the best value for your money. 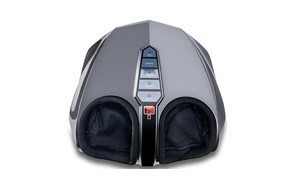 Quality - This goes without saying, it is highly beneficial to purchase a foot massager that can stand the test of time. This is what will prove that it is of good value for the money you spent. No one needs to tell you that a product that cannot last a week has officially put you at a loss, so strive for quality products because this will make you happy and, in this case, it will make your feet happy too. Electric - These devices need to be plugged into a power source to function, needless to say, there is so much more to these massage machines. They are usually powered by rapid rotating roller and pay a lot of attention to the soles of the feet as well as the tops and the ankles. In most cases, they include water and mimic the attributes of a spa, but due to the fact that they are powered by electricity, they may not be the best option for everyone. So, if you are considering picking one up, be sure to check with your doctor. Manual - This may be the crudest of them all, but it is quite good for soothing sore feet and treating conditions like plantar fasciitis. They are usually made out of wood and are still a go-to option today because they give the user maximum control over the strength and pressure of the message. It also helps that they will in no way break the bank, so if you are looking for something affordable and functional, this is the way to go. Shiatsu - As aforementioned, Shiatsu is an ancient form of traditional Japanese massage, it is done by applying pressure from the hands to knead the muscles. At this point, it is pretty obvious that massage machines can also administer shiatsu using certain designs such as rotating heads and vibrators to mimic the movement of the hands. Infrared - These are simply the types of foot massagers that use heat as a means of massaging. In some cases, the heat can be combined with kneading in order to give better results.